Jaw-dropping plateaus, ridges, gorges and gullies characterise this UNESCO World Heritage Site. 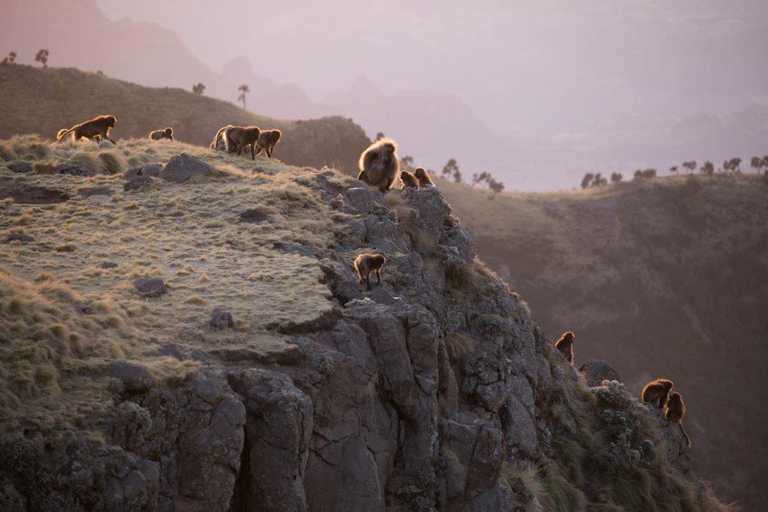 With some of the world's best trekking routes, endemic wildlife and luxurious lodges perched in hills, the Simien Mountains are Ethiopia's most popular destination, and for good reason. 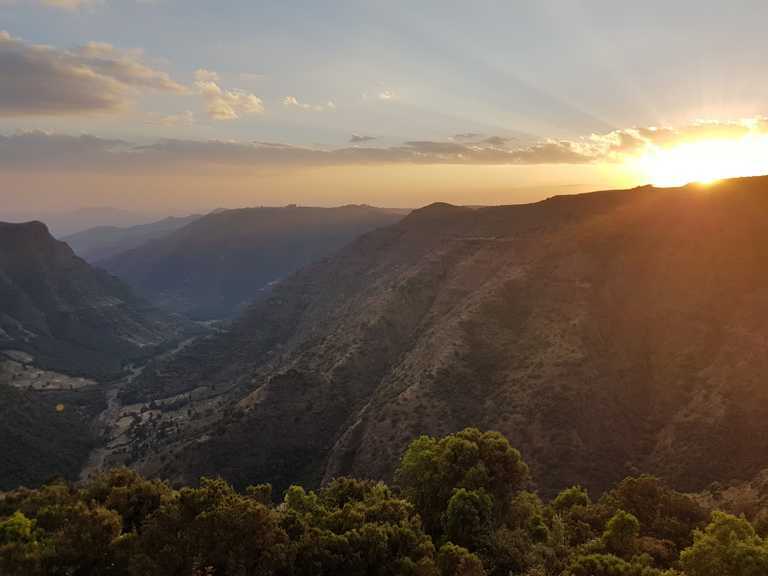 Get close to endemic wildlife, sit next to hundreds of Gelada Monkeys, spot Wallia Ibex, bushbuck , see birds soaring on the thermals beneath you, and if you’re very lucky glimpse one of the rarest carnivores in the world, the Ethiopian wolf or a leopard. 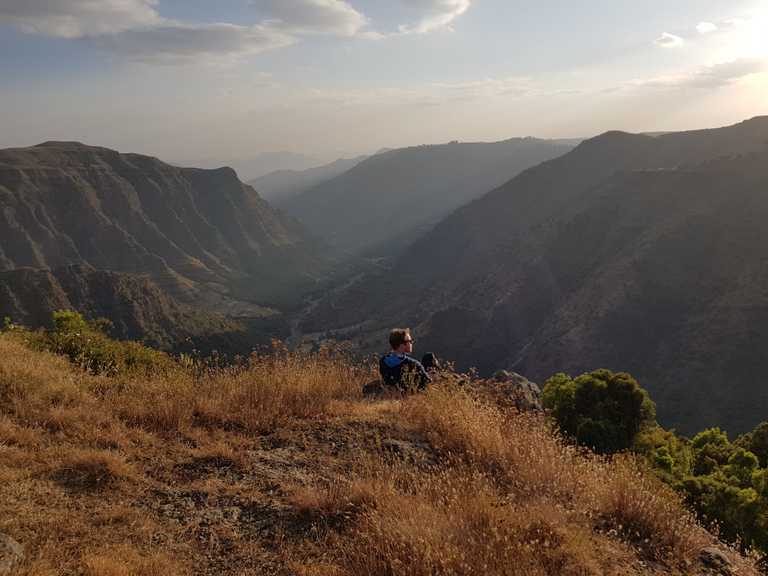 Choose from a wealth of amazing trekking routes and places to stay, whether staying for a couple of days, or embarking on a much longer adventure. 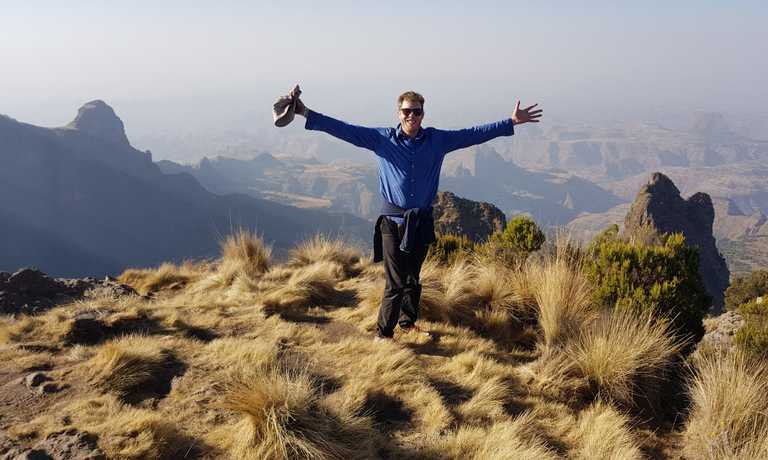 Stand on viewpoints that drop 1,500m precipitously into valleys below, experience a landscape as dramatic as the Grand Canyon and climb Africa’s highest peaks up to 4600m. Experience life as it’s been for thousands of years, visit and spend time in remote villages, with guides born and raised in the park. 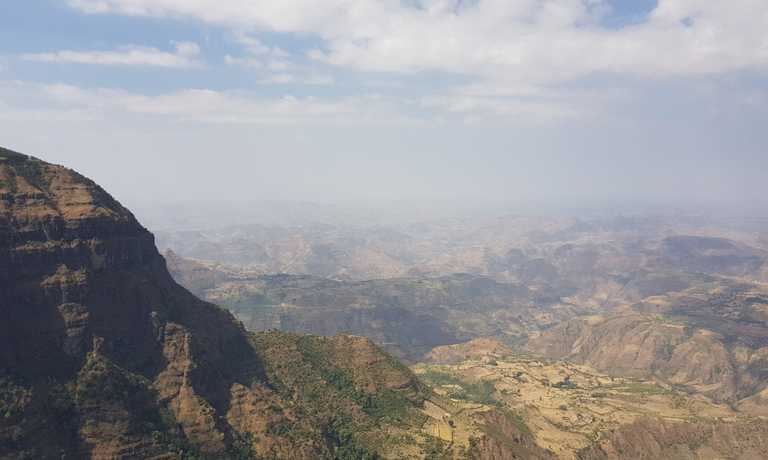 The Simien Mountains National Park is situated on the northwestern side of the Simien mountains massif in northern Ethiopia, roughly 900 km north of Addis Ababa. Situated on the northern edge of the central plateau of Ethiopia, the region overlooks the lowlands of the Tekeze River (also known as ‘Mare’ in Sudan). Politically, the area belongs to the North Gonder Zone of the Amhara National Regional State. 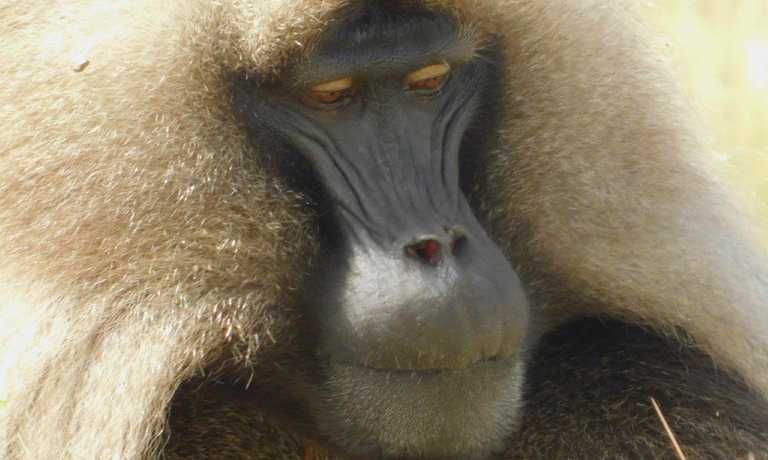 The Simien Mountains National Park itself lies in the Weredas (districts) of Debark, Adi Arkay and Janamora, and covers an area of 136 km. 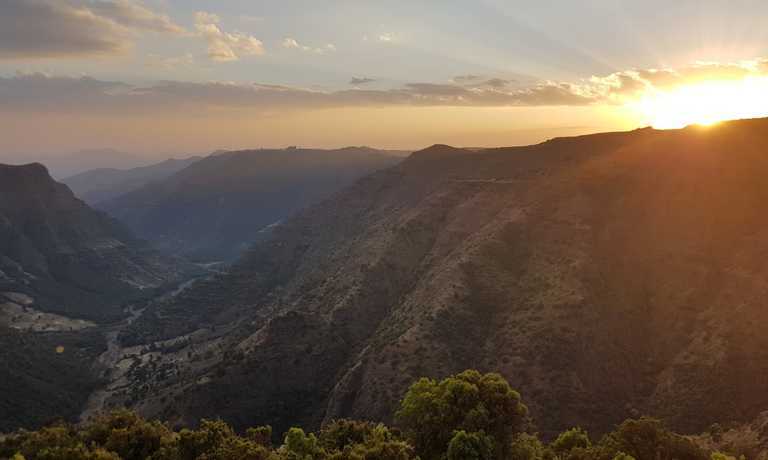 Situated in the centre of a triangle formed by Gondar, Lalibela and Aksum — three major tourist attractions that are part of the ‘Historical Northern Route’ — the region can easily be reached from any of these surrounding towns. Entrance to the Park is through the town of Debark, a market place about 110 km north of Gondar, where the National Park Administration is located. Debark, the junction town for the national park, lies 830km from Addis Ababa, 275km from Bahir Dar and 100km from Gondar along a surfaced road. It is 250km southwest of Aksum along a road that remains unsurfaced for much of its length. The 100km drive from Gondar to Debark takes up to two hours. Transport can be provided by any operator in Gondar and taxis are also available to do the run. The entrance gate at Buyit Ras is 14km east of Debark. Transport there, or to any of the lodges or camps, can be arranged through the national park office in Debark or using local tour operators located in the main towns. 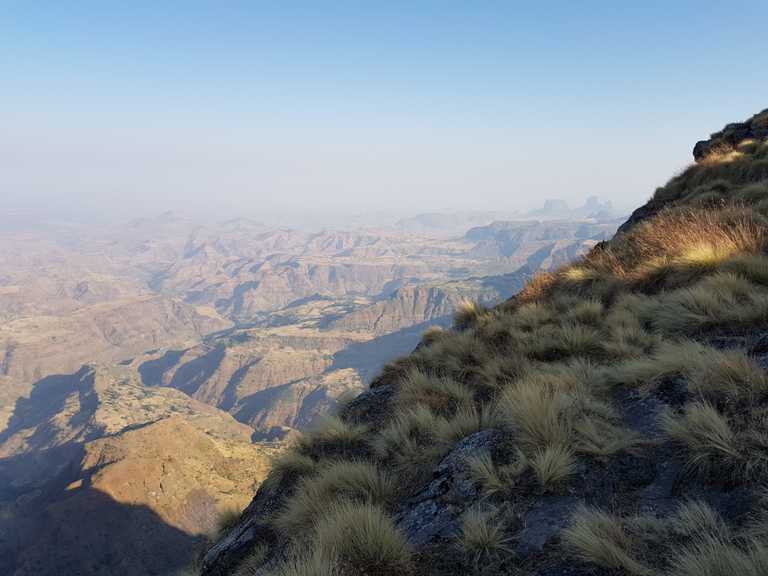 A visit to the Simien Mountains can be undertaken at any time of the year except perhaps during the rainy season, which lasts from June to mid-September. During this season, a total of 1000 to 1600 litres of rain per square meter may considerably hamper trekking activities. Muddy tracks represent a major impediment to an otherwise seamless trip. Moreover, up to 50 litres of precipitation per square meter per day (on average once a year) can make rivers become dangerous torrents. That being said, the Simiens can be explored all year round, including during the rainy season. 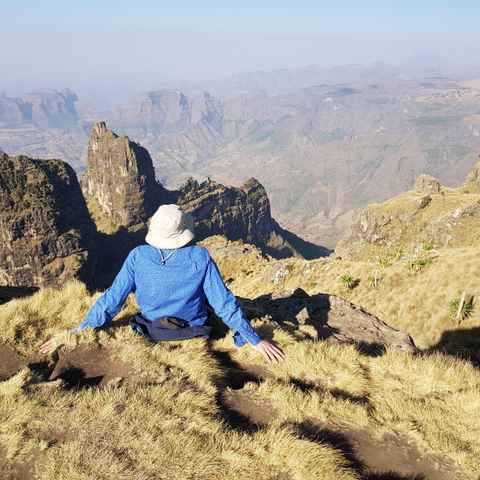 If you're with top quality guides, they'll know what regions to avoid in the rainy season and be able to show you the best of the Simiens whatever the weather. The mean annual rainfall is 1550mm falling in two wet seasons, from February to March, and July to September which is said to have become much lower since the 1960s. Temperatures range from a minimum of -2.5°C to 4°C to a maximum of 11°C to 18°C. There are often drying winds during the day; frosts may occur at night, and snow sometimes settles on the summit of Ras Dashen. All visitors to the Park must show an official entrance permit on entering the Park near Buyit Ras. This entrance permit is issued at the National Park Office upon payment of an entrance fee. The price depends on the number of days that visitors plan to spend in the National Park. A list with the most recent entrance prices, as well as the prices for many other services, can be found on the notice board at the National Park Office in Debark. Ethiopia houses 80% of land above 3000m in Africa, hence it’s moniker as ‘The Roof of Africa’, one of the few spots in Africa where you’ll regularly see snow. The Simien mountains are between 40 and 25 million years old, formed before the Rift valley by lava during the Oligocene period. The mountains are ancient volcanoes. The escarpment in the Simiens is also comprised of an extended uplift 75 million years ago. The mountains consists of dark Trapp basalt and turf, and since their creation have continued to go through the process of uplifting and erosion. The mountains are a vital source of water for communities in Ethiopia and as far as Sudan and even Egypt via the Nile! Although remote and seemingly inhospitable, the Simiens are actually home to roughly 3000 people, who have carved out a simple and peaceful life in the mountains. Due to the climate, landscape and flora and fauna, the rural population have adapted to their surroundings. Adding colour to the region, the Simiens have been used as a trade route between Askum, Lalibela, Mekele and Gonder for over 2000 years. Historically the Simiens were home to Ethiopian Jews, who after attacks from Christians withdrew into the mountains. After the the decline of the Jewish Kingdom in the 14th Century, the majority converted to Christianity, with many living in Gondar. In the late 1990s, the remaining Jews moved to Israel leaving the remaining population primarily Orthodox Christian, with some Muslim communities. Most inhabitants are farmers, often owning some livestock - sheep, goats and cattle. Horses are often used for ploughing. Due to population pressures and land subdivision (owing to inheritance), there is increasing pressure on the landscape to provide for its inhabitants and some people do receive food and assistance from the Ethiopian government. The population has grown, doubling roughly every 35 years, with about 3.6% of the park being cultivated. The people are Amharas, speaking Amharic and mostly grow barley for injera, the Ethiopian national dish. People tend to live in ‘tukuls’ which are thatched round huts, constructed of timber and with mud and cow dung that acts as plaster. While Ethiopians are famously friendly, the people of the Simiens take this a step further and are usually calm, kind and very friendly! 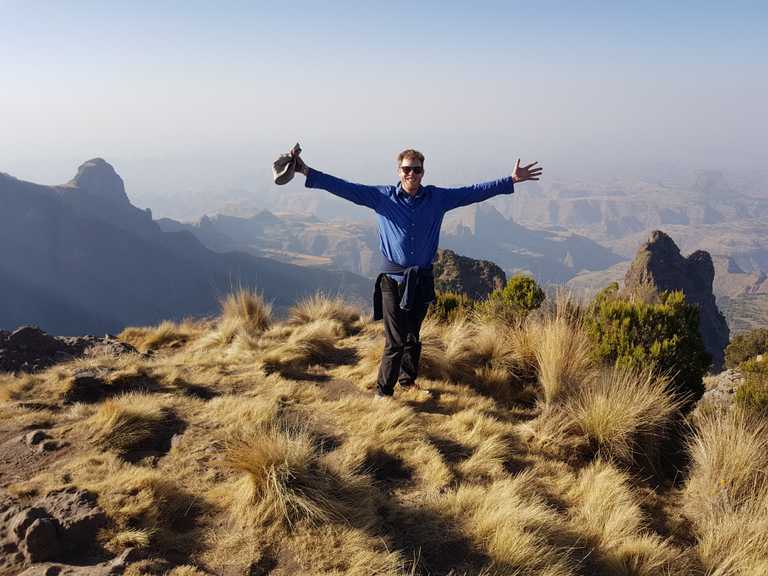 In partnership with our hand-picked local operators, we believe that the best way to see the Simiens and experience them properly and responsibly is with the best local guides. Additionally, we can help organise visits to villages, coffee and even a nights stay so that you can experience the wonder of mountain life in these communities first hand. We’ve spent a lot of time finding, testing, selecting and working alongside the best guides and operators to ensure your trip runs seamlessly from start to finish. All of our guides know Ethiopia like the back of their hand so you can rest assured knowing you're being looked after by the very best. We live for feedback and are constantly improving our services. 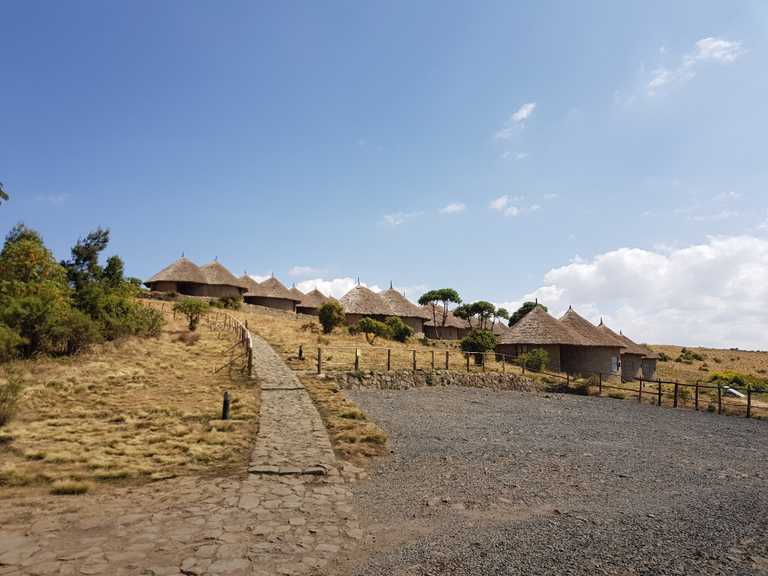 Our extensive experience exploring Ethiopia combined with the lessons we've learnt from travellers gone by means we know what is suitable for whom, which type of trip makes sense for you and how get the most out of your time in Ethiopia. With thousands of tourists visiting the Ethiopia every year, the guides and operators vary from the fantastic, to the bad and ugly. Let us help you organise the hassle free and adventure filled holiday you've always dreamed of. 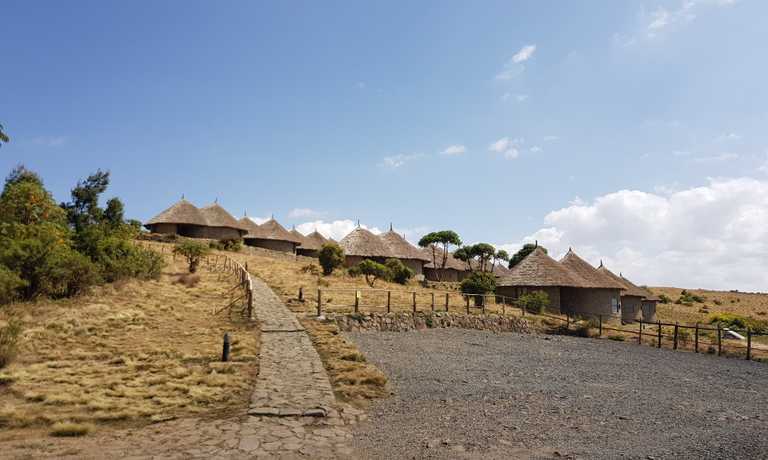 Ready to plan your Ethiopia adventure?